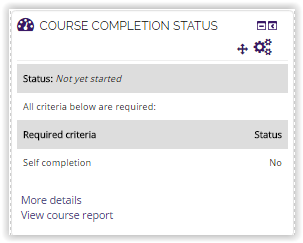 NOTE: The course completion status block will only appear if completion tracking criteria are set in Setting; to do so follow the instructions. 2. Select the opinion named: Completion Tracking. 3. Change or make sure that "Enable completion tracking" is set to Yes. Save Changes to be sure. 5. Scroll down to: Add A Block. 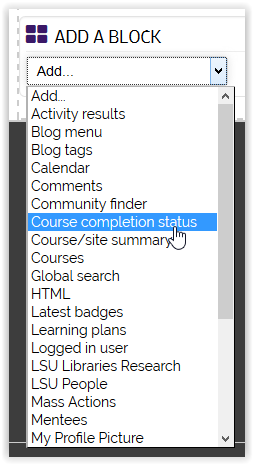 Select Course Completion Status. 6. 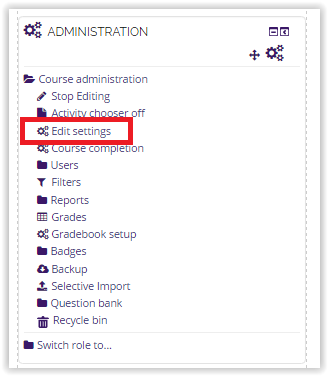 The administrative Course Completion Block should appear on the right-hand side.